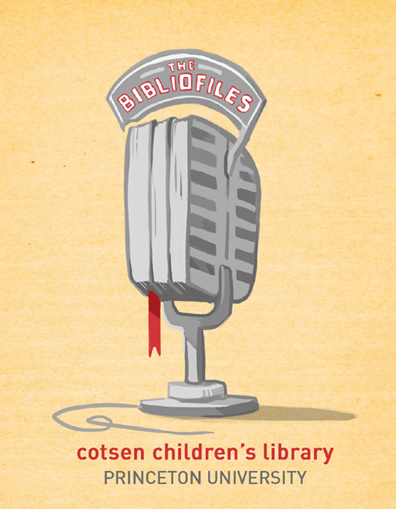 I’m delighted to announce that the BiblioFiles, our illuminating interviews with children’s book authors, are now available as podcasts! Download interviews with Phillip Pullman, Sharon Creech, Candace Fleming, Atinuke, Rebecca Stead, Gary Schmidt, Trenton Lee Stewart, M.T. Anderson, and more! To visit the main site (which includes webcasts and interview transcripts), click here. To visit podcast central, click here. Interestingly enough, it was Lloyd Alexander who inspired this program. Back in 2003, when I was still in graduate school, I decided to start reading children’s literature to counter all the academic reading I was tackling. Seeking some of my old favorites, I discovered that, happily, some authors had kept writing while I was detoured by college, working life, and graduate school. While reacquainting myself with Lloyd Alexander’s Chronicles of Prydain (“A Fflam thrives on danger!”), I found his 2003 book, The Gawgon and the Boy. It’s a wonderful story about a boy named David who, after recovering from a life-threatening illness, is tutored by his Aunt Annie (a tough individual he secretly names “The Gawgon,” after the mythological monster, the Gorgon). However, as they spend more time together, the boy realizes what a true treasure the Gawgon is. I found the book to be lively, unique, and utterly heartwarming (later, I learned that it was also semiautobiographical, which makes it even more wondrous). So, at the tender age of 28, I wrote my first letter to an author, sharing how much I had loved reading his book. And Mr. Alexander wrote back! So I wrote him back! And he wrote me back! I wrote my last letter to him in 2006. I described how I had just moved to New Jersey, having accepted a job at the Cotsen Children’s Library at Princeton University. I told him my greatest hope was to design creative literacy programs for children that would be worthy of the Gawgon. In the back of my mind, I had already decided that I once I got my legs under me, I would invite Mr. Alexander to the library for a visit. Unfortunately, it was not to be; he passed away in 2007. I was incredibly saddened by the news. While I had already shared, through my letters, how much I loved his books, I would never get to truly voice my gratitude to him. I would never get to ask him questions about his writing and hear his responses. The conversation I wanted to have with him about his characters, his inspirations, and his experiences was no longer possible. I decided that I needed to find a way to record and preserve conversations with the creators of brilliant, creative, beautiful, funny, and thoughtful children’s books. Thus, the BiblioFiles. It took some time to get the program up and running, but in 2009, I aired my first interview with the enormously talented Kenneth Oppel. It was recorded in a tiny room at WPRB, a local radio station. Shortly after that, we moved to the University’s new Broadcast Center. Originally, the interviews were aired during the All-Ages Show, a children’s radio program. Then the interviews became webcasts, and our online archive was launched. Now, the interviews are downloadable as podcasts! It’s my sincerest wish that you find inspiration in these interviews. Perhaps you’ll gain some good advice about writing, hear a character’s voice come to life, discover an interesting behind-the-scenes story, or simply learn what your favorite author’s laugh sounds like! I hope that the conversations evoke deeper connections to the books you love, and introduce you to new books you have yet to discover. Listen, laugh, ponder, discover, but most of all, enjoy. BiblioFiles artwork by the super talented Aliisa Lee. Deepest heartfelt thanks to Dan Kearns, the Princeton University Broadcast Center’s sound engineer extraordinaire. An additional shout out to Lance Harrington, the Broadcast Center’s resident wizard, for his endless patience and assistance in launching the podcast site! This entry was posted in Announcements and tagged Atinuke, author, bibliofiles, candace fleming, children, cotsen children's library, Gary Schmidt, inspiration, interview, Kenneth Oppel, lloyd alexander, M.T. Anderson, Phillip Pullman, podcasts, Rebecca Stead, sharon creech, The Chronicles of Prydain, Trenton Lee Stewart, webcasts by Dana Sheridan. Bookmark the permalink.